Happy Book Birthday TO THE STARS! Today, client Carmella Van Vleet’s debut picture book, TO THE STARS!, officially comes out! Congrats to Carmella and to her co-author Dr. Kathy Sullivan, who is the first American woman to ever walk in space. So, if you know of a little girl who loves adventure and science, definitely check this one out. For more info on this book, including a peek inside, and a downloadable educational guide, click here. Happy Agent Monday, and happy September everyone! Fall, for me, is a time of new beginnings. New books to read. New books to pitch to editors. New things to write… If you are writer, you may soon be staring down at a terrifying new thing: THE BOOK SIGNING. Well, fear not. Today I have some words of advice and encouragement for you from my wonderful and talented author, Carmella Van Vleet. Her most recent titles include the middle grade novel ELIZA BING IS (NOT) A BIG, FAT QUITTER (Holiday House, 2014), which features the hilarious and endearing Eliza (who also happens to be coping with ADHD); and the picture book TO THE STARS! co-authored with astronaut Kathy Sullivan (Charlesbridge, 2016). Take it away, Carmella! Making the Most of Book Festivals – Even If You Don’t Sell Gobs of Books! I’m proud to report I resisted the urge to unleash some inner-ninja on him. I knew he was doing his best to be supportive, but it’s a loaded question. Those of us who attend book signings and festivals know that it’s not always about the number of books we sell. For the record, I sold and signed around nine books that day. I’ve had better days in terms of sales and I’ve had worse. But despite the lower sales, I had a great time and was glad I participated in the event. Why? (I mean other than the fact I spent the day sampling the candy I’d set out to lure readers to my table.) Simple: I focused on all the other successes of the day. I got to meet another writer from the Class of 2k14 (a group of 20 debut YA and MG writers who’ve banned together online to support and help promote each other). This was a first for me. I spent the day chatting with several writers sitting nearby me. We shared advice and tips for other book festivals, school visits, and promotional materials. I handed my card to a librarian who was interested in me doing an author visit at her school. I got to participate in two well-attended panels about writing for children. Not only did I get a chance to do one of my favorite things in the whole world – talk shop – I met an editor who asked me if I would be interested in writing for their new biography series for middle grade readers. While doing the second panel, I also got to connect with an illustrator I heard speak a while back. Something she’d said in her workshop resonated with me and it ended up being a key puzzle piece that allowed my picture book to finally fall into place. It was such a gift to be able to tell this other writer she helped me and my book sold and is now scheduled for release in 2016. I was able to help a fellow writer who was struggling with the close-but-no-cigar stage of her career. (I told her the old adage is true – just when things seems darkest and most hopeless is usually when your “Yes” is just around the corner.) And I got to rave about Marie to another writer who queried her. At lunch, I spent a few minutes hanging out with an author whose writing I deeply admire – and totally experienced the “getting to sit at the cool kids table” thing. Something really funny happened to me at the festival, too. This boy around ten years old walked up to my table. When he noticed my cover, he pointed and said, “I read the first two pages of that book.” (I was pretty sure he didn’t realize he was speaking to the author.) “Oh yeah?” I asked, all excited. “Did you like it? What did you think?” The boy shrugged. “Eh. 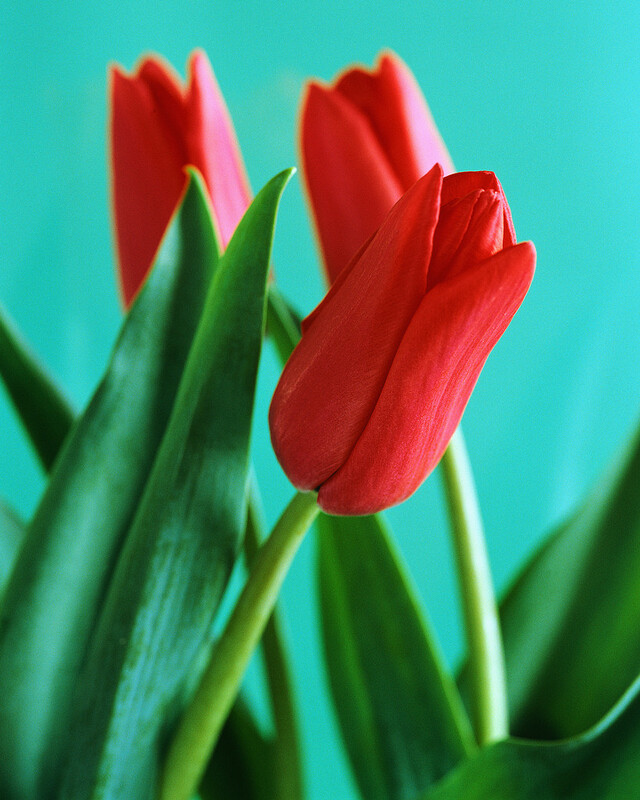 It was okay.” His mother turned red and promptly began apologizing. But I waved her off; I thought it was hysterical. I thanked the boy for his honesty and offered him a candy bar. So, in other words, I got a good story about humility to tell! You never know what you’re going to encounter when you attend book festivals. They aren’t always going to be rainbows and glitter, long lines and adoring fans. But if you keep yourself open – and remember there’s more to these things than just selling books – you’ll never have a bad day. * Get to know your book neighbors. Listen to their pitch and give them yours. When they step away for a break or lunch, help cover their table and talk up their books to readers walking by. They’ll do the same for you. * Standing up at your table is a great way to increase your visibility during crowded times. * Bring your own water and snack in case you can’t get away or there’s not a nearby volunteer. You’ll need them to keep up your energy. * Have readers spell out their names and write them on slips of paper before you sign a book. This will help cut down on inscription mistakes. * Always give a reader more. For example, I have a collection of rubber stamps I like to use after my signature. (Each stamp corresponds to a specific title. For instance, I have an old fashion key stamp that I use in my Ben Franklin book.) Another writer I know personally attaches “Autographed Copy” stickers to her books after signing. An illustrator friend sketches a kid-friendly doodle. These little touches make the book extra special. * If you’re comfortable talking to groups, volunteer to participate in panels and other activities; the people who plan book festivals really appreciate this and will remember your name when it comes time for the next event. * Don’t be afraid to connect with people even if you don’t think it’ll mean a sale. Compliment someone on their cool shirt or ask what kinds of books they read. Always be genuine but never pushy. Agent Monday: Toss Me a Hook! Happy Agent Monday, folks! I’m back from a sun-soaked weekend filled with overdoing it in the yard work department. I’m a touch sun fried and sore, but what a great switch from those mounds of Northeast snow we had to dig out of… I also spent some time this weekend digging through queries filling my inbox, and some of them made me want to cry out: Writer, PLEASE toss me a hook! Yup, today we are talking about hooks. See, sometimes I get queries with opening pages that are written beautifully, truly. But I find myself wondering what the story is about. Who is the audience? How the heck would I pitch it? These questions, if unanswered, make me worry that this book won’t fit into the marketplace. I’m a literary agent, and my job is to fit your work into the marketplace. So you see the problem. You might be scratching your head right about now wondering why an editor needs to pitch your book too. It’s because the editor, once he or she falls in love with a book, must then convince folks in that publishing company that it should be acquired. The editor in a smaller press might go right to the publisher and have a chat, or, as is the case in many of the bigger houses, may have to present the title at an acquisitions meeting. That meeting could have fellow editors, sales people, the publisher, all sitting there wondering what this book is about and where it’ll fit on their list and in the marketplace. So, please, help yourself and formulate a great hook for your book. A one-liner… Something along the lines of: TITLE is a READERSHIP/GENRE about THE UNIQUE INTRIGUING PROBLEM. 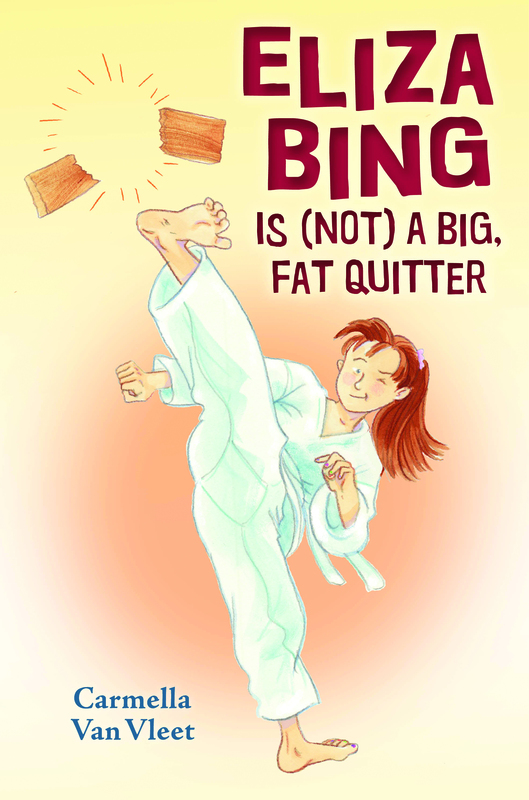 Here’s one for one of my recent client sales: ELIZA BING (IS NOT) A BIG, FAT QUITTER is a contemporary middle grade novel about a girl with ADHD who must prove to others (and herself) that she can stick with something to the very end. 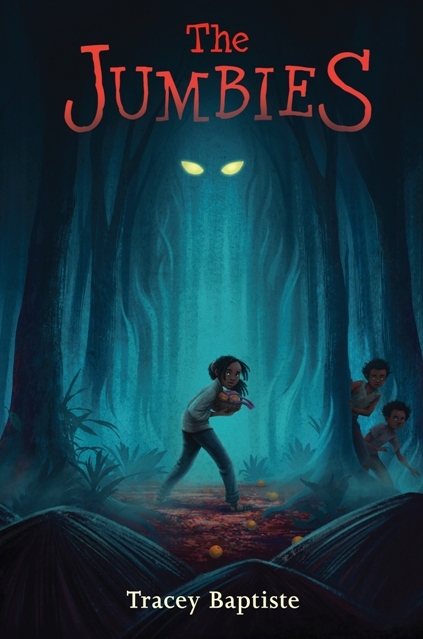 From this hook, we know the title, the demographic it’s pointed toward (middle grade), that it’s a contemporary novel (vs. sci-fi, thriller, etc. etc. ), and we see the unique hook. A book about a girl with ADHD. Cool! And we also see that there is a problem, a plot attached to it: proving to others and herself that she has stick-to-it-ness. I used this hook when pitching it to the editor. I’ll bet the editor used a version of this while pitching it to the publisher (it just came out through Holiday House). And the author, Carmella Van Vleet, uses a version of this all the time, I’m sure, when a reader comes up to her at a signing and asks, “What’s your book about?” Heck, our foreign rights rep even uses this hook when talking to publishers around the world. So YOU should figure out your own book’s hook. Include it in your query. 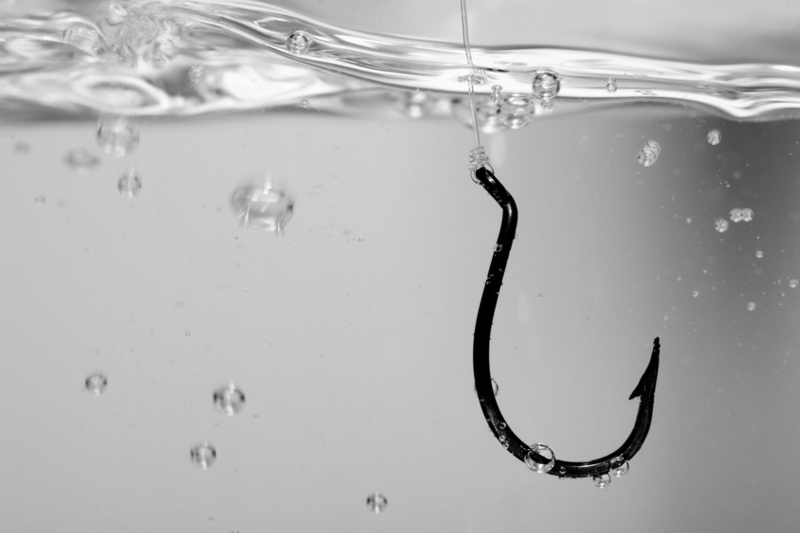 Toss us a hook, and hopefully it’ll help your novel catch on. Agent Monday: Wait, You Rep What? Happy Agent Monday, everyone! And HAPPY SPRING. Phew. Somehow this feels hard-won this year. I honestly can’t remember when seeing snow bells and crocuses in bloom has made me more giddy or brought more relief. Change is in the air, folks! And something else has made me a bit giddy… so I’m “putting out there” a shift in my agent submission guidelines. Hence today’s post title of: Wait, You Rep What? 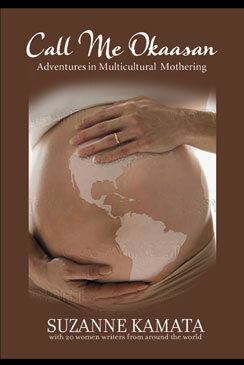 First a wonderful announcement! 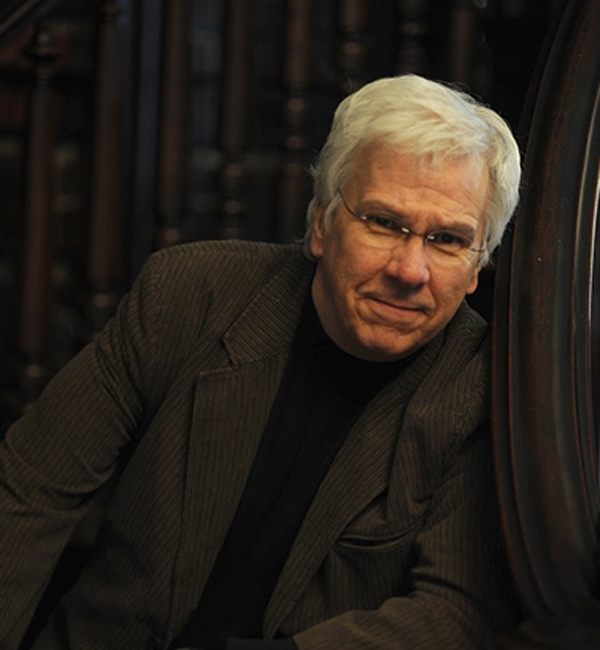 I’m delighted and thrilled to now represent picture book author/illustrator Lee Harper. Lee is well-known for creating books which are hilarious as well as breathtakingly beautiful. He is the author/illustrator of SNOW! SNOW! SNOW! (Simon & Schuster/Paula Wiseman Books) and THE EMPEROR’S COOL CLOTHES (Two Lions) and his most recent book is the lyrical and lovely COYOTE. Lee illustrated WOOLBUR by Leslie Helakoski (HarperCollins), TURKEY TROUBLE and TURKEY CLAUS, both by Wendi Silvano (Two Lions), and LOOKING FOR THE EASY LIFE by Walter Dean Myers (HarperCollins). Lee equally enjoys illustrating the works of others and writing and illustrating his own stories, and he currently has a number of his own picture book ideas in the works. Yeah! Okay, I know. My guidelines say I’m NOT interested in picture books and make NO mention of repping illustrators. So what gives? Hey, things do change. But before you hit that send button, I want everyone to know that I’m not open to picture books and illustrations from everyone. I’m actually only open to submissions from established illustrators and picture book authors, and to those sent to me on referral, or to folks who I meet at conferences and request submissions from. If you’d like to see where I’ll be when, my up-to-date appearance schedule can be found here. Sorry I can’t take submissions from everyone, but if you saw my inbox and my workload for current clients as represented on my very scary spreadsheet, you’d truly understand. I’m really excited to enter the world of representing picture book authors and illustrators! I bring to this not only my background as a writer and editor, but also my fine art background (I have a dual degree from U. of Penn in English and in Literary Art – a major I created there which combined creative writing and all the fine arts classes I could take). Plus I’ve already sold one of my client’s very cool non-fiction picture books: TO THE STARS! by Carmella Van Vleet and astronaut Kathy Sullivan, the first American woman to walk in space (Charlesbridge). So there are a lot of new things popping up everywhere…crocuses and snow bells included. I’m also still looking for great middle grade and YA fiction, adult and women’s fiction and memoir, and my guidelines for those can always be found here. 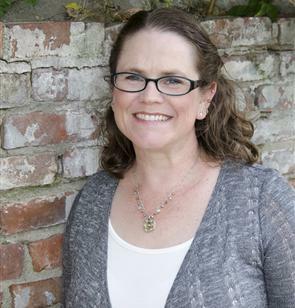 *Marie is an Associate Agent at the Jennifer De Chiara Literary Agency in New York City. To keep up with all her posts, subscribe to her site by clicking on the “Subscribe to Marie’s site here” link located on her page on the upper left margin. Happy Agent Monday, everyone! Okay, it is so cold in the Northeast that folks coming to the ALA Midwinter Conference in Philly had to contend with cancelled trains. Why? Because the train doors were frozen shut. That’s what I heard. Not kidding! Fortunately, my trains had working doors and I braved the cold on Friday and Saturday to attend the conference. Was it worth it? Definitely. I got to meet with a ton of editors, talk to publishers from all over the country and from Canada, and see a number of writers that I know as well. But what really warmed my soul was seeing the products of my first two book deals being launched! Publishing takes time, and agenting takes patience and persistence and lots of work, just like writing does. It’s an investment. 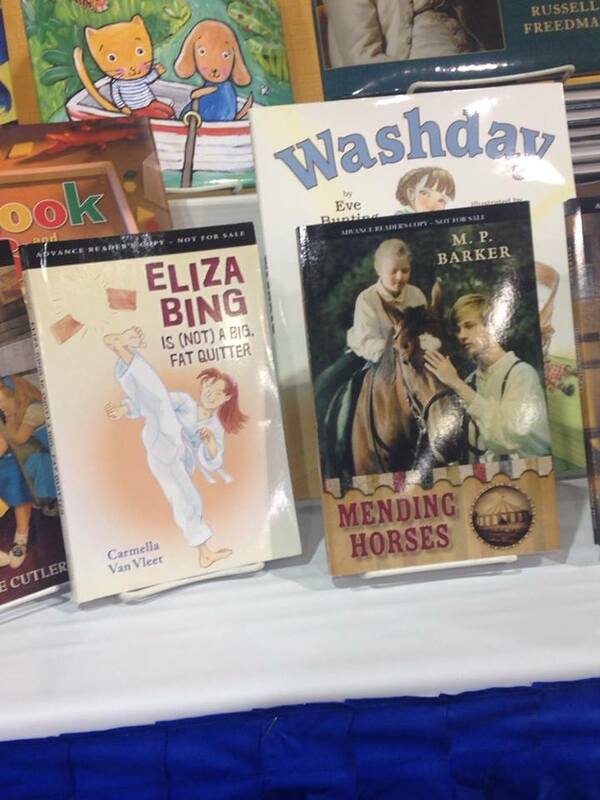 Here are two of my very first deals, published and on display side-by-side at The Holiday House publisher’s booth at the convention. And they are both on sale now. Eliza Bing is (Not) a Big Fat Quitter by Carmella Van Vleet is a fabulous middle grade novel about a girl with ADHD who must prove to others (and herself) that she can stick with something to the very end. This is Carmella’s debut novel, and it has already been honored as a Junior Library Guild Selection. I’m not surprised. Eliza’s an unforgettable character! 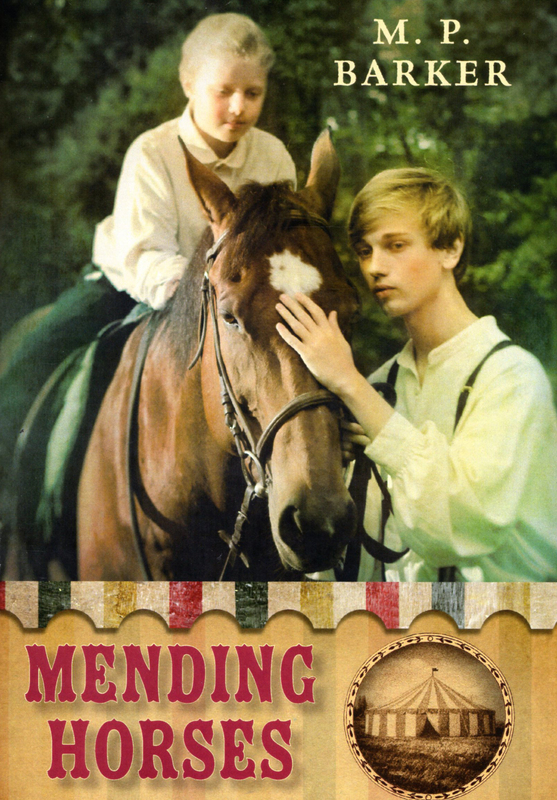 Mending Horses, a YA historical by award-winning author M.P. Barker, is one of the most beautifully written books I’ve ever encountered. Michele (the M. in M.P.) writes with such confidence and skill that you are completely absorbed in this tale about Daniel, a young indentured servant in 1800s New England, who is suddenly set free and must find his way alone. 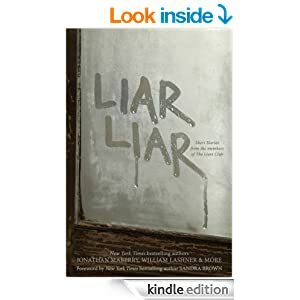 He finds a family of sorts in an old peddler, a young runaway and a traveling circus, but all is not well. The performing horses are mistreated, and a dangerous secret puts everyone at risk. Daniel fights to protect the horses, but can he save them all? To view the cool trailer for this book, click here and then click on trailer video. It was a great moment for me as an agent to hold these two books in my hands. To have a part in bringing these wonderful books to readers. But it took time. And not just for me, of course. The authors spent so much time perfecting their writing, creating their novels, revising them, finding an agent, then revising again, then working on revisions with the publisher. It’s an investment. But it pays off – over time. I look at my career as an agent thus far as a start-up business. I put in my own time to learn the ropes, to scout out clients, to build my list, and now, two years into it, things are chugging along. My authors are working on second and third manuscripts for me. I have a number of projects out on submission. New books are slotted for publication in 2015. It’s a process. I guess that’s what I hope writers will take away from this post. It’s a process. An investment. It takes time. It’s worth it. I always tell my authors to take a loooong view of their careers. That means don’t just write one book and wait for it to sell. Work on something new while the other is on submission. Writers, don’t let past discouragements in your career stop you from writing and moving ahead. Learn from it and keep going. I’m a writer, too, and there are many times that I could have stopped and said, enough! But I didn’t, and I’m so glad I gave myself that time. When things derail your writing career, it can be hard to have that sort of perspective. But keep working and you will look back after 20 years of writing and producing work and see that stumbling block as something small in perspective. If writing is your passion, keep going. It’s an investment. And expect an agent that will invest in you. A good agent will be viewing you over the long career you have ahead of you. Not dropping you if a project doesn’t immediately sell. You will continue to write, to grow and to get better and better. Writers with talent are worth investing in. Now back to work, everyone! Put in that time.